Experience Required: No previous flameworking or glass blowing is required. 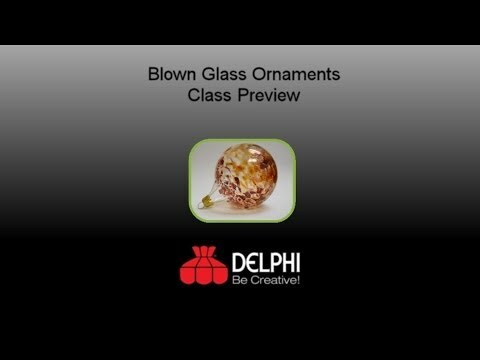 Class Description: Create custom blown glass ornaments the simple way. Making custom glass ornaments is easy with Glaskolben pre-blown clear glass cylinders with blow pipe ends. These ornaments have the look reminiscent of traditional European artisans. Students will use a Hot Head torch and MAPP gas to create several ornaments. Use 90 COE frits and stringers to customize your holiday decorations. No previous flameworking or glass blowing experience is required. All materials are included except for MAP/Pro gas. Tools & Materials Included: Each student will have the use of a complete workstation, including torch, hand tools and glass. Glaskolben pre-blown clear glass cylinders Glass frit Safety glasses will be provided. Additional Tools & Materials: Students must bring 1 tank of MAP/Pro gas - (Delphi does not sell). Available at most hardware or big box home improvement stores. Pros : Great for beginners. Enjoyable. Learned a lot! Other Thoughts : Can't wait to practice the technique on my own. Pros : I loved the class!! I was able to take home 10 glass globes that I made. It was a very fun class and easy to understand. Now I have to just practice to get the perfect globe! LOL!! Pros : The class was paced perfectly with lots of help to get the perfect globe. Lots of enjoyment!! Cons : I wish the store had been open for us to buy added materials and that we could buy a sampler pack of frit for future use at home. Other Thoughts : Wish I lived closer so that I could take more of your excellent classes. Pros : Instructor was very helpful. Time was perfect. Pros : Great Job . Other Thoughts : We had so much fun and learned a lot. Timing just right. Pros : Very well taught. Other Thoughts : It was so cool..
Pros : Val was great, I have several ornaments, some even round, that I can hang on my tree. Cons : I thought there were too many people at once — crowded by the heat of my neighbor’s torch on one side, breaking glass globes by the woman overblowing on the other side. And I think the class needs a bit more time. Felt rushed at the end, and would have liked a bit more one-on-one attention for the first couple. The one where she was standing right there and telling me when to move in the flame and when to blow came out perfectly. I think if I could have had another one or two with that kind of help I would have had a much higher success, and lower stress, rate. Pros : Excellent instructor! You get to make 12 ornaments. It makes great gifts and looks cool on your tree. Cons : Found out on second class that I should NOT have used same MAP gas container as it didn't burn hot enough for me to blow my ornaments properly. Will bring full one next time. Other Thoughts : I've taken this class twice so far and am planning on it again.